Look up mangabey in Wiktionary, the free dictionary. 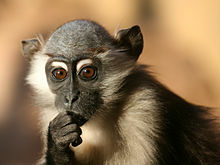 The term mangabey can refer to three different genera of Old World monkeys in the tribe Papionini. Lophocebus and Cercocebus were once thought to be very closely related, so much so that all the species were in one genus. However, it is now understood that the species within genus Lophocebus are more closely related to the baboons in genus Papio, while the species within genus Cercocebus are more closely related to the mandrill. This page is an index of articles on animal species (or higher taxonomic groups) with the same common name (vernacular name). If an internal link led you here, you may wish to edit the linking article so that it links directly to the intended article. This page was last edited on 26 December 2018, at 04:06 (UTC).